During the Arizona Coyotes’ recent five game losing streak, the emphasis of playing a complete 60-minute game was as elusive to this team as snow on a Caribbean island. While the Coyotes managed to earn marginal, one-goal leads in recent games, mistakes and shaking goaltending prevented any measure of success. On Friday night, events transpired at a similar rate, and as play developed, the outstanding issue, once again, was the Coyotes ability to play a complete 60-minute game. 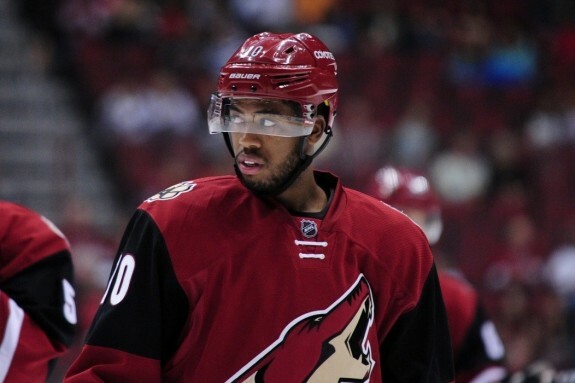 When Anthony Duclair scored mid-way through the second period to give Arizona a three-goal lead, the question remained, whether the Coyotes could tighten the vise. Throughout a critical third period, Arizona accepted the challenge, and held the visiting Calgary Flames to just five shots on net. Though goalie Louis Domingue lost his shutout mid-way through the final period, the result was a solid, 4-1 victory over Calgary before 13,643 In Gila River Arena. The win snapped the Coyotes’ five-game losing streak, and provided the team with a long-lost dose of confidence. In drawing Calgary as their opponent Friday night, the Coyotes faced a similar situation as Wednesday night. They encountered a team which was playing in back-to-back games. On Wednesday, they dropped a one-goal decision to Vancouver (Canucks won in Colorado the night before), and the Flames were coming off a dramatic shoot-out win Thursday night in San Jose. This time, the Coyotes fore-checked, back-checked and kept the slot clear for Domingue to see the first shot. The result was firm execution over the course of the entire game. The Coyotes’ combustible engine was in blast-mode, and the complete effort was from notable from the start. When captain Shane Doan scored less than 4-minutes into the game, the Coyotes manufactured their usual early lead. What followed was an anathema from their previous efforts. Tallies from Oliver Ekman-Larsson and Duclair pushed the lead to 3-0, and the Coyotes continued their relentless attack. After the morning skate, coach Dave Tippett challenged the leaders to step up, and be leaders. After the game, Tippett cited Oliver Ekman-Larsson, Martin Hanzal, Mikkel Boedker and Doan as principal catalysts who responded to his clarion call. After a three-point night, including a pair of goals, Doan seemed to carry his team forward. Plus, he had help. Ekman-Larsson scored his 16th of the season, and chipped in two assists. This time, the Coyotes appeared ready. What turned to be a catalyst for their first victory in regulation since they defeated the Kings on Jan. 23 was play of the special teams. On the power play, the Coyotes scored three times with the man advantage. More importantly, and for the second straight game, they allowed no shorthanded goals. Though they continue to be one of the porous teams in the NHL in trying to successfully kill penalties, the effort over the past two games has been encouraging. Then again, that’s only their recent two games. If special teams remain an important part of future success, execution is the key variable. With a first period goal, captain Shane Doan tied the franchise record for most career points. The goal represented his 929th point and that tied Dale Hawerchuk for the franchise lead. Scoring against Winnipeg on December 31, Doan passed Hawerchuk for the franchise lead in goals scored. On Friday night, Doan did not stop with his first goal. He picked up a power play tally late in the game, and added an assist to the goal from Ekman-Larsson. That now gives Doan 931 points and counting. The goal early in the first period was his 20th of the season, and marked the 13th time he reached the 20-plateau with the Winnipeg/Phoenix/Arizona franchise.